Here at TriMech, we pride ourselves in providing the best technical support experience possible for our customers. No one enjoys needing outside help when they have an issue, we understand that. It's our goal to make sure that we not only solve your problem, but make it a pleasant experience while we do. That said, there are certain things you can do to make sure the troubleshooting process goes as smoothly as possible. Email support@trimech.com or call 888-TRIMECH (888-874-6324). While our Account Managers and Application Engineers really do love to hear from their clients, this usually isn’t the most efficient way to get assistance for a technical problem. It’s not uncommon for these guys to be out of the office, with another client or preoccupied with a training class. Instead, get to know TriMech’s dedicated Technical Support Team. They’re already waiting for you to call or email! Is this issue specific to your machine, or are other users in your company experiencing the same behavior? Is this issue file-specific, or do other files demonstrate the same behavior? If the file is stored on a network drive or in a PDM system, does the issue persist if it's saved locally or taken out of the file vault? Know the version and service pack you have installed. You can find this by opening SOLIDWORKS and going to Help > About SOLIDWORKS. 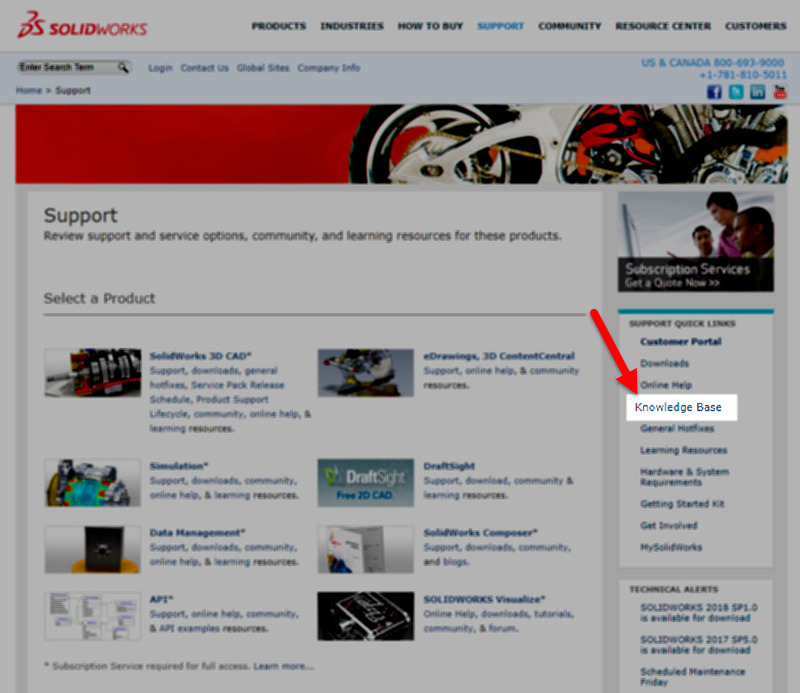 Check out the SOLIDWORKS Knowledge Base. 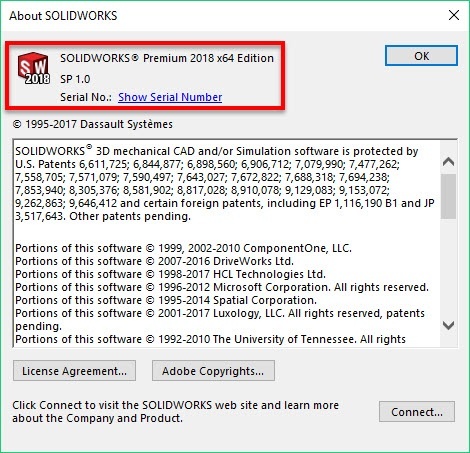 Many SOLIDWORKS users are unaware that they have access to the very same knowledge base that their reseller uses to search for errors and issues in the CAD software. You can find it in the Support section of the SOLIDWORKS website. Doing a quick search in the Knowledge Base may help you avoid calling tech support altogether! Know the exact wording of the error message. The Technical Support Engineer will likely be doing a search on any error messages received, therefore knowing the exact wording of the glitch is key. We recommend taking screenshots of any error messages so they can be easily referenced when you call. Capture your issues using SOLIDWORKS Rx. 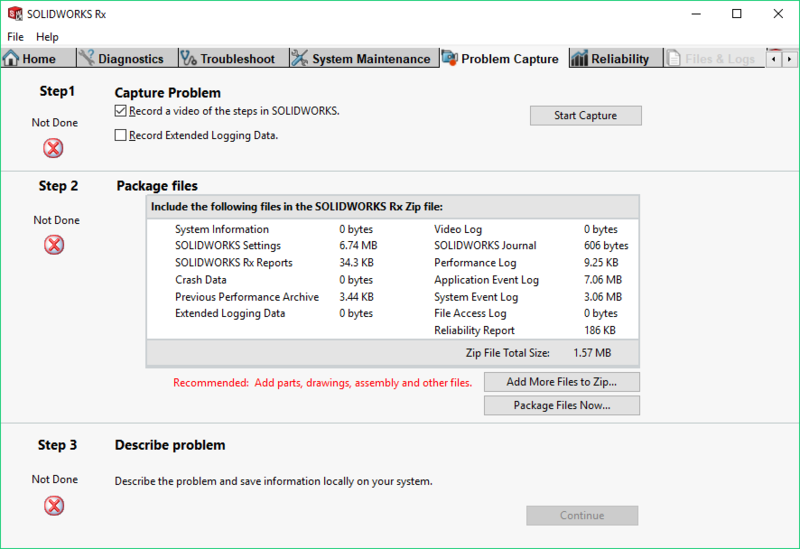 If the issue you’re experiencing is repeatable, SOLIDWORKS Rx can be used to create a video recording of the issue. It will also gather tons of pertinent background information, such as hardware specs and event logs. It’s not uncommon for a Technical Support Engineer to ask the caller to perform an Rx capture. So, if you do it ahead of time, you’re already that much closer to getting a solution. Be prepared to send us files. If you’ve got weird or buggy behavior that is specific to a certain file set, it is extremely helpful for us to be able to test the behavior on our own machines. If it's very large, we can set up a file share for you to upload it. Don’t forget to use Pack & Go to maintain your references for assemblies and drawings. However, if you cannot send us your files due to your own company restrictions we can work around it. If you can’t send us your designs, then any information you can provide is even more important. One of the more frustrating situations for both clients and Technical Support Engineers is when there is an issue that cannot be shared with us by sending the files or doing a remote screen share. In these situations, the more information you can provide, the better. Screenshots are great. If you can recreate the issue with a dummy file that doesn’t contain sensitive information, that’s even better. Documenting a detailed workflow of “clicks” to recreate the issue is definitely valuable information. This is an instance where SOLIDWORKS Rx captures can be extremely helpful. Everyone out there has at least one technical support horror story. Here at TriMech, we understand that if you’re calling us, you might be a little unhappy with your software, at least at the moment. By following this advice, you can get yourself that much closer to a speedy resolution. Help us, help you! Want to save our Technical Support Team for the bigger issues? Check out our training classes so you can deal with everything else.